A friend faced the following problem: his company has to provide confidential data to a financial company. To maintain the confidentiality of the data, this financial company provided my friend with a custom-made program to “protect” the data to be provided. But my friend doesn’t trust unknown programs, he wanted to know exactly what protection this program offered. The financial company didn’t want to provide further details about their program, so my friend called me for help. To remain confidential, data transferred on public channels must be protected with strong encryption, the implementation of the cryptographic process must be free of errors and the cryptographic keys must be managed securely. First we get acquainted with the program. In fact, it’s very simple: you start the program, open the file to be protected and save the resulting file with another extension. So there’s no password to be provided. This is an indication that the cryptographic key is stored in the program. This is no problem, as long as public key cryptography is used. However, if secret-key cryptography is used, the secret key can be retrieved from the program by reverse engineering and can then be used to decrypt the data. The protected file is much smaller (around 4 times), so compression is involved. A first glance at the protected file with a hex editor (like XVI32) doesn’t reveal much, there’s nothing readable. One can follow 2 paths to identify if cryptographic methods are used in a program: you can analyze the program and you can analyze the data. When analyzing the program , the goal is to identify cryptographic algorithms. The cryptographic library can be linked statically or dynamically. For Windows programs, you can use a dependency viewer (like Dependency Walker) to view the imported DLLs. For statically linked programs, you can use FindCrypt2 by Ilfak. It’s an IDA Pro plugin that looks for cryptographic constants in the disassembled code. They come from the zlib library, an open source library for GZip compression. The –lr options displays ASCII output with regions (sequential parts of the binary files). Now we protect several other files and compare them: the size is different and only the first 10 bytes are the same. Now we will concentrate on the encrypted data. Strong ciphertext should be hard to distinguish from a series of random bytes. CrypTool is a freeware program which enables you to apply and analyse cryptographic mechanisms. It’s an excellent educational program. We will use it to see how “random” the encrypted data is. We password protect it with ZIP but don’t use compression, just store. We analyze each file with the CrypTool cryptanalysis tools and compare the results. I won’t detail each result here, but we have 2 important results. The maximum entropy is 8. The difference in offset is 249 bytes, almost the size of the header and status data (265)! This is a strong indication that the protected data is just compressed, not encrypted, and that it’s GZip compressed. Both files share the same sequence of 1791 bytes! Wow! The GZipped file is almost completely included in the protected file, except for 19 bytes (this is very likely the GZip header which contains, among other things, the original file name). To test our hypothesis, we strip the first 266 bytes from the protected file (with the tail command), name it test.gz and decompress it with the gzip command. Success! We have recovered our original file, and we prove that the so-called “protection” provided by the program is not encryption, just standard compression! It can easily be defeated in a few seconds with 2 simple commands: tail and gzip. This analysis has taken us about 2 hours. My friend has his answer about the protection level provided by the program. Now it’s up to him to report this to his manager and decide how to proceed. Later on, I started reverse engineering the program. The first 10 bytes are a fixed string, the so-called magic bytes, used to identify the file type. The next 256 bytes are just random bytes generated by the program, and have no meaning whatsoever! The program seeds the RNG with the current time, explaining why protecting the same file twice gives a different 256 byte sequence. Bytes from 267 on: encrypted GZipped data. Yet Another Case of Security Through Obscurity. Or, quoting Bruce Schneier, “Snake Oil”! Do you have Mailslots on your Windows PC? Tuesday July 11th, second Tuesday of the month. IT professionals working for a Microsoft shop know the drill: patch Tuesday. MS06-035 Vulnerability in Server Service Could Allow Remote Code Execution. One vulnerability fixed by this patch is the “Mailslot Heap Overflow Vulnerability – CVE-2006-1314”. According to the Microsoft Security Bulletin, a mitigating factor for this vulnerability is “Microsoft Windows XP Service Pack 2 and Microsoft Windows Server 2003 Service Pack 1 do not have services listening on Mailslots in default configurations“. Good, but what about non-default configurations? When do you have mailslots on your machine? Maislots are an Inter-Process Communication (IPC) protocol. It can be used by processes (running programs) to communicate with each other. It’s easy to create programs using mailslots. Your server program listens to a mailslot by creating a file starting with \\.\mailslot followed by the name of the mailslot (e.g. \\.\mailslot\listener) and starts reading from that file. Your client program talks to a mailslot by creating a file starting with \\server\mailslot followed by the name of the mailslot (e.g. \\MyServer\mailslot\listener) and writing a message to it. The Server Service will transport your message from your client program to your server program. More details can be found on MSDN and sample code is available on The Code Project. Hence any program designed to use mailslots can open a mailslot on your Windows PC, making your Windows XP SP2 machine vulnerable. You can list the mailslots opened on a machine by enumerating the files in the \\.\mailslot directory. Mail me or post a comment if you want the compiled program. Running this program on a fresh Windows XP SP2 install shows nothing: as stated by Microsoft, a default install has no mailslots. The mailslot \\.\mailslot\messngr is used by the Messenger service (the service that displays a popup when you issue a NET SEND command). Alerter is used by the Alerter service to display administrative alerts. 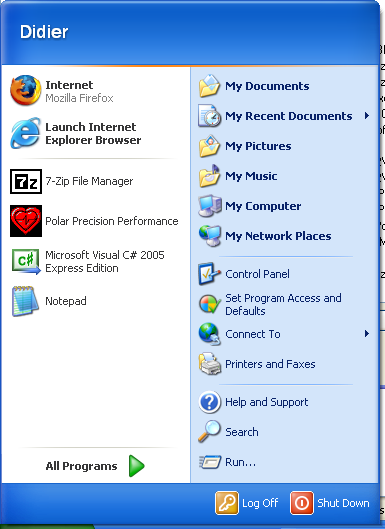 These services are disabled on Windows XP SP2 and Windows 2003 SP1. In fact, when you enable and start these services on a default install, the mailslots will be created and my program will list them. 53cb31a0\UnimodemNotifyTSP is used by the Telephony service. This will also show you the process that opened the mailslot. svchost.exe is a generic process to host Windows services, you’ll have to open the properties of the process and select the Services tab to view which Services are hosted by the process. I’ve also discovered (with my program) that McAfee uses a mailslot. This gives you a method to check if a Windows machine has mailslots and hence if it’s vulnerable. Few details have been published about this vulnerability, the best I found is by TippingPoint. I wonder when H D Moore will publish an exploit module for his Metasploit framework. Ryan was inspired by my post Viewing strings in executables and explains how to unpack Packed Executables. I was having an interesting chat with a colleague. He is developing a VB6 application for his personal use, and has some of his friends beta-testing it. At one point in the conversation he asked me if it’s possible to view the strings in the compiled application, because he tried and didn’t see them. It turns out he implemented a popup message to remind his beta testers to check for an update, and wondered if this would be easy to circumvent. It’s usually easy to circumvent, I’ll explain it here for my colleague and you. Strings used in the source code of VB6 are stored as UNICODE strings in the compiled executable. UNICODE strings are usually encoded in UTF-16 on Windows, as UTF-16 is the standard format for the Windows API. ASCII characters are encoded with 2 bytes in UTF-16. So for example, the string “Hello” is represented as 48 00 65 00 6C 00 6C 00 6F 00 in UTF-16. It’s because of the 2 bytes per character that my college didn’t remark the string. You can see strings “1/1/2007” and “Hello” listed at the beginning. The red U indicates that it’s a UNICODE string. The first hexadecimal number is the position of the string in the file (hello.exe), and the second hexadecimal number is the position of the string in memory when the executable is executed. So you will find string 1/1/2007 at position 000016D0 in the file and position 004016D0 in memory. BTW, this technique to dump files will almost always fail when analyzing malware, because these files are often packed or encrypted. A simple trick to view the strings of such malware code is done with Process Explorer by Sysinternals. When the malware is running (you’ll want to run it on an isolated machine, like a virtual machine), start Process Explorer and display the properties of the running malware. The Strings tab will show you the strings in the file (Image) and in memory (Memory). Since the malware as unpacked/decoded itself when it started, you’ll be able to view the strings in memory. Back to our example, hello.exe. We recognize a date, 1/1/2007. When you run the program (on a day before 1/1/2007), nothing happens. When you run the program after 1/1/2007 (by changing your computer clock), the Hello message box appears. So now we have clearly established that the string 1/1/2007 is indeed the date after which the message box is displayed. How would someone modify this program to avoid the message box? A simple trick, which requires no programming skills, is to change the date 1/1/2007 to a later date, say 1/1/3007. You’ll need a hex editor to do this, like the free XVI32. The cursor is know positioned at the beginning of string 1/1/2007. One can argue that this technique can only be applied to very simple programs, which have few strings and which store dates as strings. This is partially true, because it’s still easy to find dates in programs that don’t use dates for their normal operation. Like the program of my colleague. It’s almost 1 Mb large, but it only uses dates to decide when to display the message box. So they are easy to find, and easy to modify. In fact, I didn’t use this string patching technique to show him how his message box could be disabled, but I changed the program logic by analyzing the assembler code and patching a few bytes. I will explain this in a next post. But this shows my colleague how easy it is to disable his message box. But this will not stop a determined attacker, there are even generic unprotection tools for ASprotect.